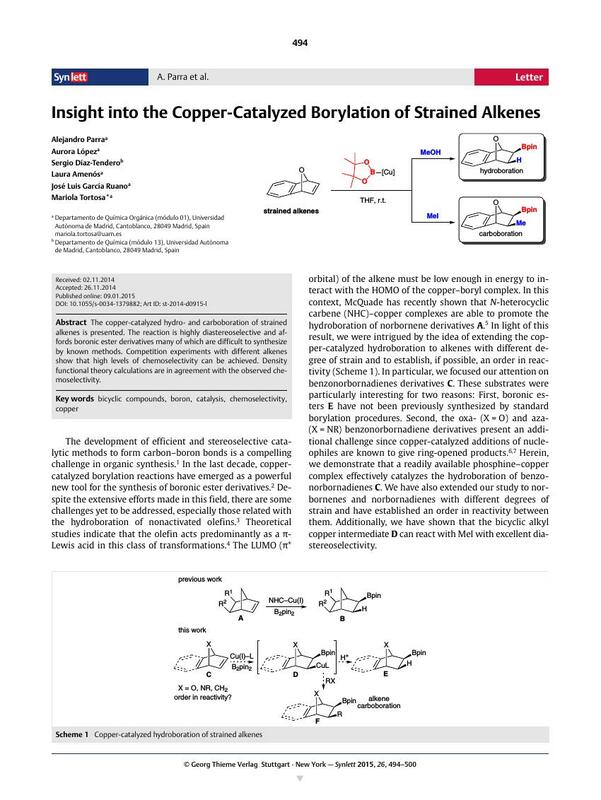 The copper-catalyzed hydro- and carboboration of strained alkenes is presented. The reaction is highly diastereoselective and affords boronic ester derivatives many of which are difficult to synthesize by known methods. Competition experiments with different alkenes show that high levels of chemoselectivity can be achieved. Density functional theory calculations are in agreement with the observed chemoselectivity. Supporting information for this article is available online at http://dx.doi.org/10.1055/s-0034-1379882. 11 We selected compounds 1a, 1c, 1d, and 1e to study the influence of the ring strain and the bridgehead atom in the copper–boryl complex insertion. We did not include azabenzonorbornadiene 1b in the competition study because additional steric effects from the tosyl group, not present in the other bicycles, could also affect the reactivity.